In the decade Richard Yaffin has been buying and selling heirloom jewelry from his Biltmore Village store, this is the first time he can remember having so many new neighbors at once. Walking down Brook Street from his shop on Boston Way, the owner of Estate Jewelry Ltd. can now find a women’s clothing boutique, a yarn store and a real estate office that were not there three months ago. If he wanders along All Souls Crescent, he can see windows are already being wrapped for a second women’s clothing store making the move to Biltmore Village. Nine independent businesses will open by June — all within 90 days of one another. But business owners and developers say Biltmore Village is more than the sum of its historical markers and cobbled streets. Behind the scenes, its merchants association is working to retain the destination’s old-world charm in a modern way while trying to prepare for how Asheville’s growing pains will encroach on the 117-year-old district. 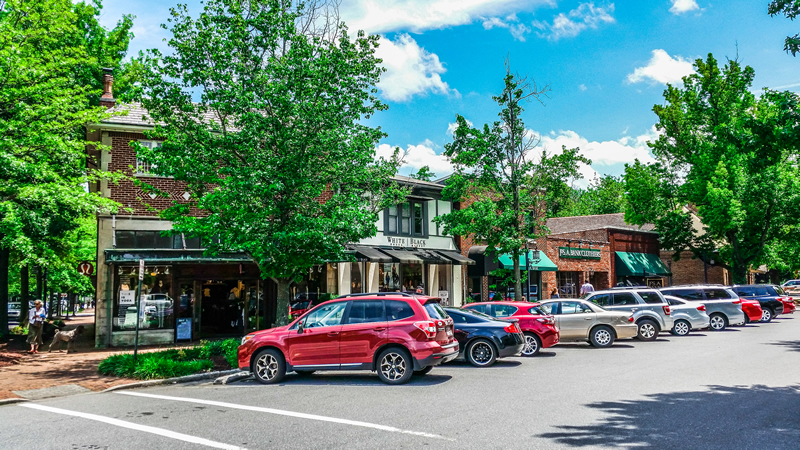 Envisioned by George Vanderbilt as a company town for Biltmore Estate workers, Biltmore Village now houses 87 establishments — from restaurants and retail shops to a church and an urgent care center. Now, the historic district will welcome two women’s clothing boutiques, a real estate office, two massage therapists, one acupuncturist, an art gallery, a yarn shop and a local clothing company. Having the nine new businesses opening within 90 days of one another has been a welcome change for Biltmore Village, Dowell said. All but one of the nine spaces being filled by new businesses were either vacant or recently vacated. During the recession and even within the past year, Biltmore Village has seen its share of businesses close or relocate. Katuah Market, a local grocery store at 2 Hendersonville Road, closed March 31. An olive oil and balsamic tasting shop, The Tree and Vine, closed this spring. The Last Straw, a home goods store, has since closed its Biltmore Village location, too. “Unfortunately, we’ve lost a couple of really good businesses that we hated to see go, but, again, this is the opportunity to bring new merchants to the village,” Dowell said. Eighteen years ago, Reed fell in love with the quaint district designed to match the look and feel of an English village. After running Yummi Yarns in Burnsville for 13 years, Reed has opened a second Yummi Yarns. There is also money flowing into Biltmore Village. Many retail businesses and restaurants in the village have reported anywhere from a 5-20 percent increase in sales from 2013-14. So far, Dowell said, those numbers are holding strong for 2015. Part of that credit can be attributed to the general uptick of the economy, Biltmore Village store owners agreed. The rest of the credit, they said, goes to the Historic Biltmore Village Partnership, a group formerly known as the Biltmore Village Merchants Association. In the last year and a half, the merchants association quietly changed its focus and its name when it became the Historic Biltmore Village Partnership. Part of that shift involved attracting new businesses to the shopping destination and touting its appeal. “Members are going out and reaching out to our neighbors down in Fletcher and on Hendersonville Road to get them here,” Dowell said. When their lease was up at Biltmore Park Town Square, co-owners DeDe Souza and Tara Hackett decided it was time to move their women’s clothing boutique, Bette, into Biltmore Village. “We have more people that are coming to Asheville every year as tourists for the Biltmore Estate — beer, hiking, you name it. But everybody goes to the village,” Hackett said. They also said the new rebranding campaign Biltmore Village adopted last month was a draw for them. Foster said the push for a new logo, website and walking-tour map was a priority for the partnership. Ted and Carol Simpson decided to evolve with the times. Though the husband-and-wife team had run the Fresh Produce Sportswear store on 18 Lodge St. for more than five years, the couple realized their beachy clothing store no longer belonged in the mountains. At the end of 2014, they closed Fresh Produce. In mid-April, they opened Bohême at 10 Brook St.
“I think like anything else, things have to stay fresh to keep people’s interest,” Ted Simpson said. As activity swells around the historic district, new and longtime business owners said they worry about parking, traffic and sidewalks. Dowell said the problem isn’t necessarily the amount of parking but the overall perception surrounding parking at Biltmore Village. “You can’t always park right in front of the store you want to go into, but there is some parking in the parking garage and obviously there’s on-street parking, too,” Dowell said. The underground parking garage at Chico’s has 152 parking spaces. On-street parking can be found throughout the village and, according to Dowell, Biltmore Property Group owns property at 2 Fairview Road. In a pinch, the property can accommodate overflow parking. The same cannot be said for traffic, though, which isn’t likely to get better anytime soon. In December, the city approved a 254-unit development project for the River Mill Lofts off Thompson Street. “Biltmore Village could become a neighborhood center as well as a tourist center with this project,” said city Planning Director Alan Glines. For now, Foster said the only thing Biltmore Village can do is continue to attract businesses and customers, while monitoring growth outside the historic district. “The focus needs to be on Biltmore Village and we need to make sure it’s a safe and beautiful historic place for everyone,” he said.